The sun managed to break through the trees towering over Aggie Lane as she hunched over in the dirt trying to unearth a ripe, red onion. The sound of squirrels rustling and bees buzzing filled the air, along with the occasional passing car. Lane’s tan sweater popped against the darkness of the soil. The right leg of her jeans had a dirt stain where she had knelt time and again planting over 100 garlic cloves. Her shoes that used to be white were covered in a layer of dirt; her left shoe held together with a wide piece of black tape wrapped around the front. 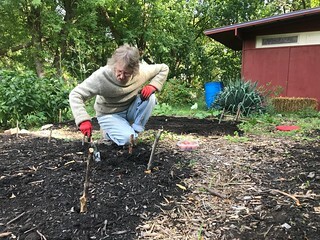 Here, at the community garden Lane started with her next-door neighbor in 1992 at 341 Midland Ave., is where Lane first began growing roots for her future activism. Walking into Lane’s home where she lives with two housemates, there’s a mix of furniture and patterns, along with floor-to-ceiling shelves overflowing with used books. Every wall has a piece of art, each with its own story. Among the art was a photo of El Salvador and a colorful quilt based on the Lakota tribe. Lane’s favorite is a picture of an African woman with a child. 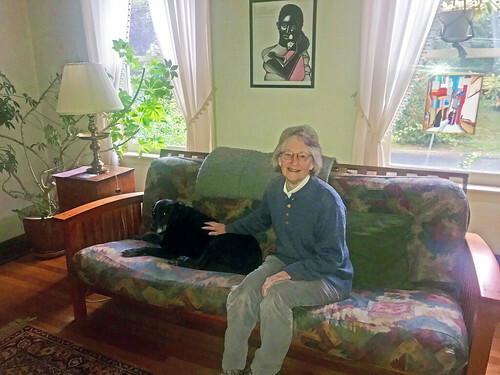 The strong sense of culture on her walls embodies the life that she purposely lived, with her drive to end racism at the center of the causes the 73-year-old has taken up. Lane, a retired industrial engineer turned community activist, is a white woman who lived in affluent communities for more than half of her life. She has spent many of her “golden” years dedicated to making her voice heard as she fought for the South Side community she planted herself in 26 years ago. Her experience immersing herself in other countries has led her to put pressure on local government for fair treatment and job opportunities for low income and minority residents. The South Side community is a section of the city with high rates of concentrated poverty and unemployment. About 33 percent of Syracuse residents live in poverty, but the rate of poverty in the 13202-zip code Lane lives in is nearly 58 percent, according to the U.S. Census Bureau’s 2016 American Community Survey. In the same zip code, 31 percent of blacks and 33 percent of Hispanics were unemployed, compared to about an 11 percent unemployment rate in all of Syracuse, the community survey found. Lane diligently works to combat poverty on the South Side through the Urban Jobs Task Force (UJTF)she created to promote local employment on upcoming developments such as the I-81 project, especially for minorities. She was awarded the Building Equity Service Award by UJTF in March to honor her decades of commitment to pushing for racial equality. 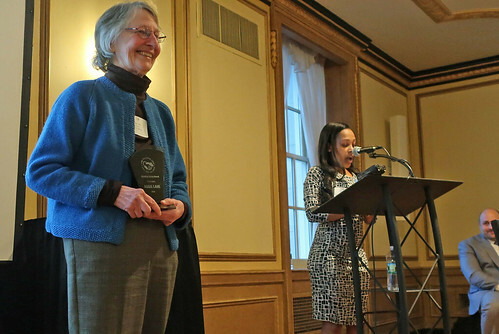 Aggie Lane accepts the Building Equity Service Award March 14 from Deka Dancil, president of the Urban Jobs Task Force, to a standing ovation. 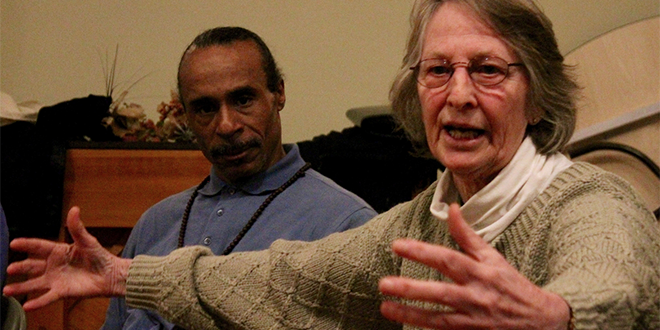 The award was presented by for her decades of work fighting for social justice in Syracuse. Lane was born in Washington, D.C., but she describes her childhood as growing up in an enclave on Long Island where everyone was white except for the servants. She credits four young black girls for helping her realize she was living in a “white bubble.” Lane said she maintained the savior mentality she learned from her mother until a trip to Nigeria to teach math raised her consciousness. The harsh realities of the racism and colonialism she saw hit her so hard, she found herself in a state of depression. Her newfound enlightenment would later go dormant as she fell into the routine of traditional life — marriage and kids. Lane said she took a close look at her life when she was raising her three children in Fayetteville. She felt she was a part of the segregation problem in the country and decided to make a change. This is when, she says, she began her journey of getting out of her bubble. She packed up and moved to the South Side in 1992. Lane said she knew everyone might not be welcoming, but by getting active in the community and intentionally seeking out diverse relationships, she felt less like an invader. She quickly made friends with her next-door neighbor, Lula Donald. It’s not that people were upset Lane moved in, but they didn’t understand what she was trying to do, Donald said. 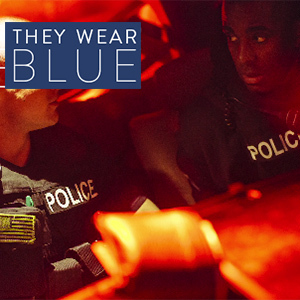 Once Lane moved into the neighborhood, a new wave began to rise of fighting back and taking a stance for the community. Neighborhood residents put up a notable fight against the building of a sewage plant on the South Side, but it was built anyway. Ryan McMahon, now the Onondaga County executive, was a part of the conversations while serving in other offices. McMahon didn’t single Lane out, but he said he disagrees with the loud approach of activist groups like the ones Lane was part of. But he admires her nonetheless. Ed Kinane, Lane’s long-time housemate, said Lane has struggled handling her internalized racism, and methodically tries to deal with it. Lane said she has long been aware of, and owned, her personal racism and bias, but she doesn’t consider herself an activist who is quick to jump on the bandwagon. She said her engineering background shaped her into a solution-driven and research-first activist. “I think things are really complex, so I tend to be slow in screaming and shouting until I’ve done the research to understand the issue,” Lane said. In a way, moving to the South Side was, and has been, a form of research for Lane. As a white woman, she was concerned with racism, but hadn’t experienced it herself. It’s one thing to read about or talk about it, Lane said. But when it is your neighbors that suffer as a result of racism, you get a different perspective, she said.